Before we spend days researching a stock idea we’d like to take a look at how hedge funds and billionaire investors recently traded that stock. The S&P 500 Index ETF (SPY) lost 8.7% through October 26. Forty percent of the S&P 500 constituents are down more than 10%. The average return of a randomly picked stock in the index is a loss of 9.5%. This means you (or a monkey throwing a dart) have less than an even chance of beating the market by randomly picking a stock. On the other hand, the top 25 most popular S&P 500 stocks among hedge funds had an average loss of 8.8%. In this article, we will take a look at what hedge funds think about Vodafone Group Plc (ADR) (NASDAQ:VOD). Telecommunications giant Vodafone Group Plc (ADR) (NASDAQ:VOD) was owned by 18 hedge funds tracked by Insider Monkey as of June 30, a slight decrease quarter-over-quarter. However, hedge funds were generally quite bullish on the stock, owning 7.9% of its shares, which is high for the ADRs of a foreign company. Vodafone also easily topped our countdown of 25 Dividend Stocks that Billionaire Ken Fisher is Bullish On thanks to its hefty 9.19% dividend yield. The company has resisted calls to slash its dividend, with new CEO Nick Read aiming to maintain the company’s existing dividend policy. 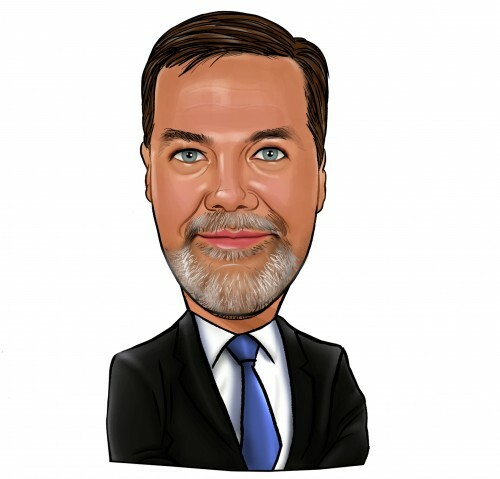 What have hedge funds been doing with Vodafone Group Plc (ADR) (NASDAQ:VOD)? At the end of the third quarter, a total of 18 of the hedge funds tracked by Insider Monkey were long this stock, a dip of 5% from the previous quarter. 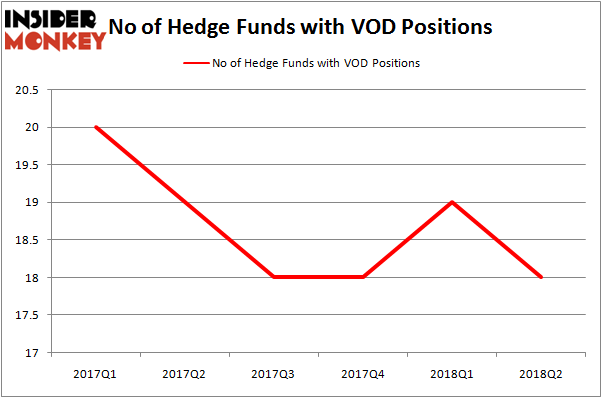 The graph below displays the number of hedge funds with bullish position in VOD over the last 6 quarters. So, let’s find out which hedge funds were among the top holders of the stock and which hedge funds were making big moves. More specifically, Ken Fisher’s Fisher Asset Management was the largest shareholder of Vodafone Group Plc (ADR) (NASDAQ:VOD), with a stake worth $687.8 million reported as of the end of June. Trailing Fisher Asset Management was Renaissance Technologies, which amassed a stake valued at $159 million. Beech Hill Partners, Highfields Capital Management, and Huber Capital Management were also very fond of the stock, giving the stock large weights in their portfolios. Because Vodafone Group Plc (ADR) (NASDAQ:VOD) has faced a decline in interest from the entirety of the hedge funds we track, logic holds that there is a sect of hedge funds that elected to cut their entire stakes last quarter. At the top of the heap, Matthew Tewksbury’s Stevens Capital Management dumped the largest investment of the “upper crust” of funds followed by Insider Monkey, valued at close to $2.1 million in stock, and Paul Tudor Jones’s Tudor Investment Corp was right behind this move, as the fund dropped about $0.5 million worth. These transactions are intriguing to say the least, as aggregate hedge fund interest was cut by 1 funds last quarter. Let’s also examine hedge fund activity in other stocks similar to Vodafone Group Plc (ADR) (NASDAQ:VOD). These stocks are Shire PLC (ADR) (NASDAQ:SHPG), Ryanair Holdings plc (ADR) (NASDAQ:RYAAY), Garmin Ltd. (NASDAQ:GRMN), and BanColombia S.A. (NYSE:CIB). This group of stocks’ market values are closest to VOD’s market value. As you can see these stocks had an average of 24 hedge funds with bullish positions and the average amount invested in these stocks was $1.27 billion. That figure was $915 million in VOD’s case. Shire PLC (ADR) (NASDAQ:SHPG) is the most popular stock in this table. On the other hand BanColombia S.A. (NYSE:CIB) is the least popular one with only 5 bullish hedge fund positions. Vodafone Group Plc (ADR) (NASDAQ:VOD) is not the least popular stock in this group but hedge fund interest is still below average. This is a slightly negative signal and we’d rather spend our time researching stocks that hedge funds are piling on.